Writing about your experiences can be fun, fulfilling and create extra income. The faster the change, the greater the premium on nostalgia. 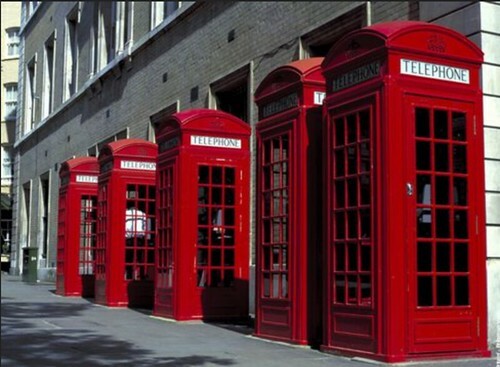 Take the London phone box as an example (1). The original red box started with a competition in 1924 that was supervised by the Royal Fine Art Commission. The design of Sir Giles Gilbert Scot, who later designed the Battersea Power Station, was selected. They became a part of British landscape. Then change, especially in the form of cell phones changed all that. People want what they perceive they no longer have. The good old days seem better than they were. The booths began disappearing in the 1980s, when British Telecom became a public company and mobile phones became the norm. 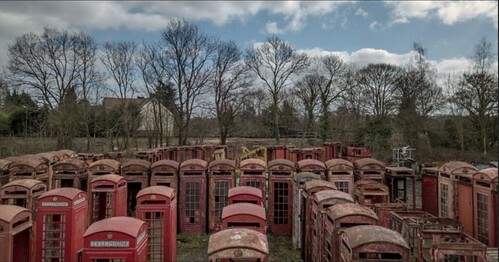 Most were sent to the scrap heap and an engineering and transport company run by Mr Tony Inglis’s got the job to remove phone boxes from the streets and auction them off. 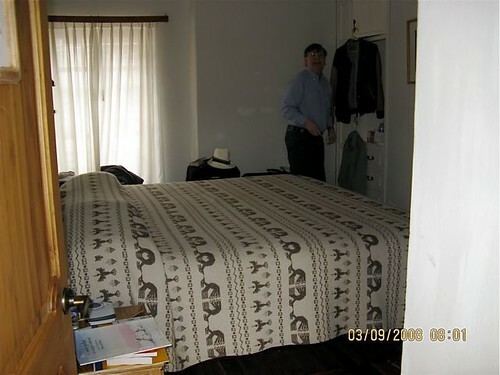 He ended up buying hundreds of them himself, with the idea of renovating and selling them. The idea worked. The red box may have been off the street, but they were not out of the public’s hearts. They were no longer needed for phones, but nostalgia made them beacons that attract customers. Businesses used this nostalgia to create new uses for these red icons. 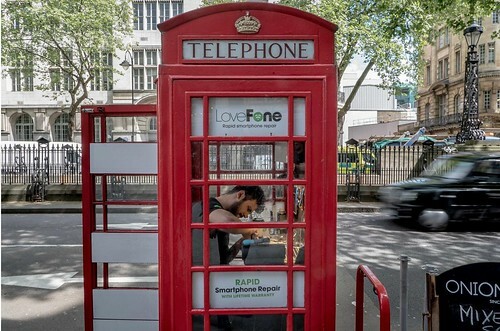 Most cellphone repairs, including fixing cracked screens, can be done in this tiny workshop in London. 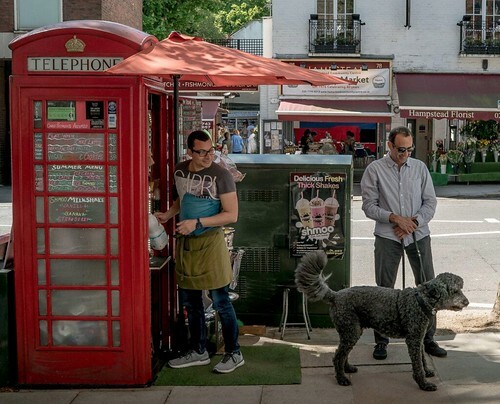 Artisan coffee and locally made pastries have replaced the telephone in this kiosk in North London. People want what they perceive they have lost. We no longer have the need to sit cozily around a fire. Yet once central heating was perfected, everyone wanted a fireplace. We no longer need to go into the woods. Once the road systems in America made it possible to drive almost everywhere on paved roads, four wheel drive off-road SUVs and pickups became the most purchased cars in the country. Nostalgia sells best in times of rapid change. Change has rarely been faster than now. Rapid change makes your experiences a valuable resource that you can write about! See below why Merri and I love writing and think about writing a bit about your past for fun and extra income. Here is a marketing rule that can make you rich. This was my first car. A powder blue 1958 Chevy. The marketing rule explains why I love the thought of it, but also why I would not want to drive it (or one like it) now. This rule can help you earn a little extra… or a lot. At least the rule helps you see with greater clarity what’s going on in this confusing, modern world. The rule is that people look at the past through rose colored glasses. The good old days seem better than they were. People want what they perceive they no longer have. This 1958 Chevy. When I see one… “Wow what a great old car”, I think. Compared with today’s cars… it was a load of crap. I have a friend who rebuilds classic cars. He tells me that purists want classics to be exactly as they were. Not for long. Not if they are driving them. Drum brakes. No power, ball joint steering. No air-conditioning. Roll up windows. Big block, gas guzzling engines. Purists rarely drive them long. They end up clipping them (welding an old body onto a modern car). New features in cars really do make them better. Yet we see classics and remember. They seem better than they were. People want what they no longer have. We no longer have the need to sit cozily around a fire. When central heating became perfect, everyone suddenly wanted a fireplace. We no longer need to go into the woods. Once the road systems in America became perfected so you can drive anywhere on perfectly smooth paved roads, the four wheel drive off-road SUV became the most purchased car in the country. This rose colored rule manifests itself in funny ways. Take Pabst Blue Ribbon beer. PBR was really popular… in the 1970s,. It died, hitting a low in 2001, when PBR sales dipped beneath a million barrels. Then PBR reignited. PBR even overtook Coors and Sam Adams. Americans drink over 350 times more PBR now than in 2001…because the nostalgia caught on with younger drinkers. The nostalgia spilled over borders as well… in funny (but profitable) ways. The nostalgia for Pabst Blue Ribbon led the business to be sold for over 700 million dollars… to a Russian company. In China, Pabst released a new beer called “Pabst Blue Ribbon 1844” for consumption in the domestic Chinese market. This is NOT low premium beer. It sells for 44 U.S. dollars a bottle. Here we are… a divided world in a divisive time. The good old days are selling “Make America Great Again”. This has been happening in Britain and now New Zealand and numerous other countries too. Just remember… the good old days look better than they were. Understand… it’s frightening to look ahead. Whatever you are doing in businesses add in a bit of the past. Look forward as you offer the past. That’s the way to get rich. You don’t have to be short of funds regardless of your education, what you do, whoever, wherever you are. This form of richness lifts you well beyond dollars and cents. These courses teach you how to start with your own core business and it can be anything that interests you. You’ll see how it can be gardening, farming, fishing, golf, finance, travel, photography, art, construction, machinery, inventions. whatever. Nicki’s husband wrote: Nicki, her sister and two nieces were visiting Ecuador for 3 weeks in January – Her Kindle books have paid for her trip so she loves that. When you enroll in this special tuition offer of price of $499 you receive the three courses and the bonuses worth a total of $947 for almost a third the price. You save $648 total. Here is a tip that’s an important asset in life as well as self publishing, the Control Concept. Meteorite in Nicaragua. ISIS in the Middle East. California drought. Global Warming. Ebola and West Nile Virus. We cannot control these big things in our life. This is why it is good that there is one thing we can improve and control with the control concept. The control concept works in any type of business and in many areas of life. Take for example a self publishing business. 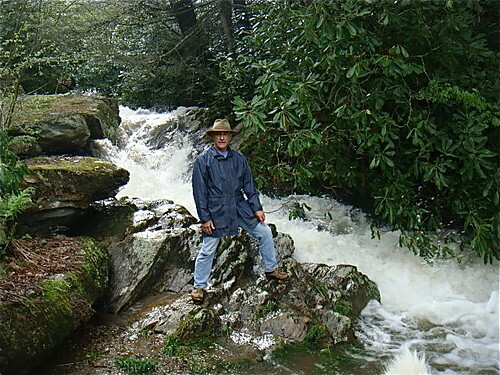 Self publishing is a great way to turn your passion into profit. This type of business helps bring control into your life. You get to work where you want, when you want. To have such control, however, you need control over your marketing. 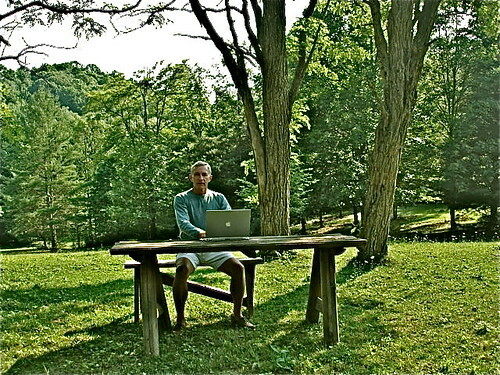 Self publishing lets me work where I choose, even in the woods on a hot day. The control discipline comes from taking whatever stability you have and improving it one step at a time. In a self publishing marketing piece, the control is a profitable promotion that has not been beaten by a test package. Sometimes a control marketing piece lasts six months. Other controls last for many years. The key is to gain control using one step tests. Control based testing to improve self publishing promotions use the principle, try only one new thing at a time. 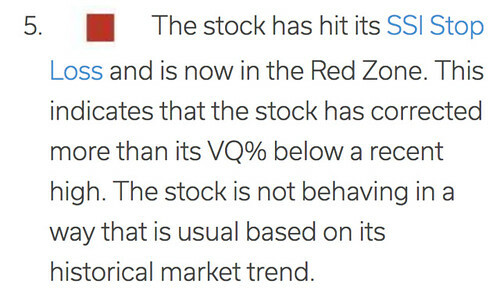 A good way to sell publications is to continually market with your unique control story while, at the same time, trying test marketing promotions. When a test marketing story is more profitable than the control, it becomes the control. This is a never ending process that creates a never ending evolution in business. There are two types of marketing tests: the “Total Test” and the “Modified Control Test”. The Total Test tries a concurrent, but completely different marketing story to the control. A modified “Modified Control Test” completes the control to a concurrent modified control marketing story that has just one change. 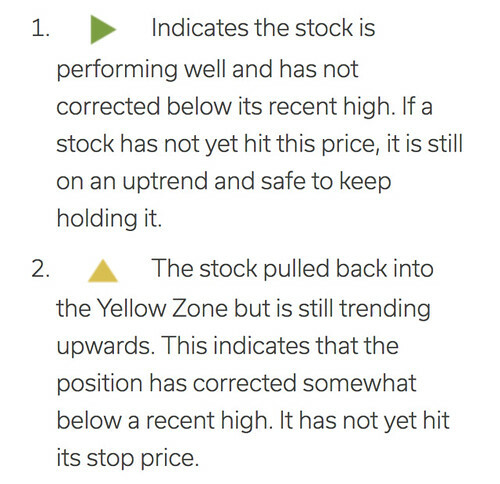 For example, the stories may be identical but the “Modified Control” may have a higher or lower price on the offer or a different headline or a different picture. The key to good modified control testing is to test as few changes as possible at a time. Ideally there is just one change tested at a time. Otherwise the publisher does not know which change causes a test piece to succeed or fail. Market testing should also include the ancient form of learning called, Theraveda. Theraveda says to learn from others but integrate what you see and hear from teachers with your own experience and feelings. Focus your marketing on your uniqueness, then test! This is your passion that you are publishing. The key to marketing success of your publications is finding a niche of unique like minded souls who have a common interest. Your niche is unique. Your readers are unique. Your publications are unique. Your marketing should be unique as well. For example once I did a direct mail test to see if an enclosed stamped return envelopes helped increase sales. My marketing stories were built around the principle of giving readers a lot of valuable information FREE in my marketing stories because giving infinite goods free massively increased the value of scarce goods. When I marketed through direct mail, I did not include a self addressed prepaid return envelope. A friend, a hugely successful self publisher, told me that my sales would increase 30% when a stamped reply envelope was included with a mailed marketing piece. I tested this concept by mailing 20,000 marketing letters. All were identical in every way except half had a stamped reply envelope. Half did not have any stamped envelope. The 10,000 letters WITHOUT the stamped envelope outsold those with the envelope by 10 to 1! Had I taken my friends advice without testing, I would have lost a lot of business. Why was my friend so incorrect? My readers read my marketing pieces because they were unique in that they contained so much useful, valuable free information. The inclusion of the stamped envelope converted the information from free valuable information to tainted sales stuff. The addition of the stamped prepaid envelope converted the image of my efforts from useful data to a marketing piece… so it was more often chucked in the garbage without being read. Most of us want… no need is a better word, some control in the ever harder to control world. The control concept can help bring control into your life. Gain better control one step at a time. Use Cro… Cross Referenced Optimization to avoid eating crow from poor finances or business failure. 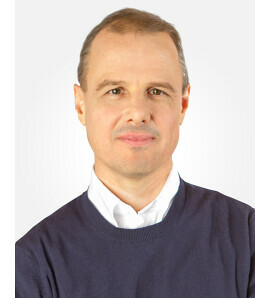 See a lesson in profits from CRO from one of the world’s best export pros, J. Peterman. Our focus in the year ahead will be helping our readers earn… in three new… low stress ways… that do the human community… (whether it is big or small)… good. As this year ends and the new year begins we’ll focus on Ecuador exports…Positive Community Media and Multi Dimensional Sustainable lifestyles that earn in multiple ways. This message today focuses on Exports and the power of marketing using Cross Referenced Optimization (CRO). There has been a lot of information touted about how to build a business with good search engine ranking. Most of it is old school thinking fit only for really big business. However you can use CRO to beat the big guys in business. Take for example Ecuador roses. 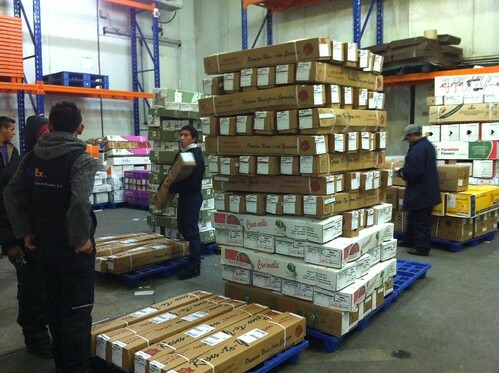 The biggest season for Ecuador roses is Christmas and guess who is the the largest shipper of Ecuador roses for this Christmas season… by far? Our flower supplier just sent this note. Gary, I see lots of orders coming in. It was a good decision to offer 25 roses. We (you and I) have the biggest shipment for Christmas, by far surprising everyone else, including the big guys who ship directly from Ecuador. 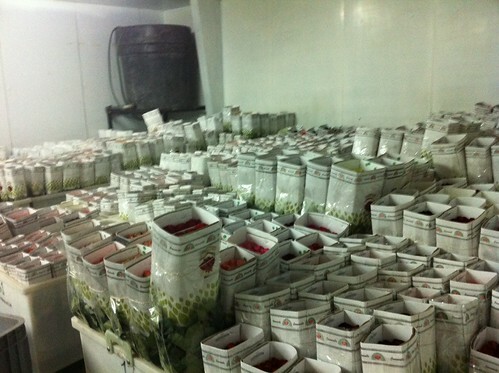 This is such a wonderful feeling seeing the roses pile up in the cold room. created as the Ecuadorians help share the beauty from their land and hearts. What is really interesting… and of profit to you… is that Merri and I are not in the rose business. We offer the roses simply because our readers love them and so we can donate the proceeds to help provide scholarships for young Indigenous in Ecuador who would otherwise miss university. This success comes because we have learned how to use CRO to collect like minded souls interested in Ecuador who also happen to like Ecuador roses. CRO marketing works obliquely by spotting cross references and hidden connections. CRO does not approach markets head on but uses a sideways momentum to capture highly competitive markets at a really low cost. 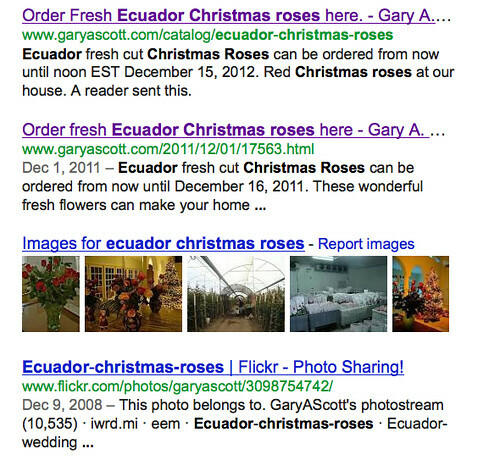 If you search Google for the phrase “Ecuador Christmas Roses” eight of the first nine links were to our websites garyascott.com, Ecuadorliving.com and successguidelines.com. Keep in mind that Merri, David and I are NOT in the rose business. 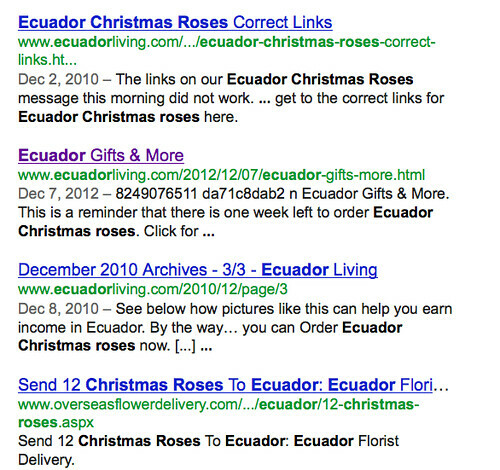 Yet we sell thousands and thousands of Ecuador roses… almost by accident. Well… I admit. I really love roses so I can and do wax eloquently about them as I do about the people of Ecuador. These facts have something to do with this little success, but mainly the answer is that we have cross referenced a connection between people interested in Ecuador and those interested in Ecuador roses. This example may seem simplistic, but the concept is worth a fortune. One of the biggest expenses in internet marketing (or almost all direct marketing) is the cost of acquiring potential buyers. Most direct marketers who use specific product terms in Pay Per Click (PPC) campaigns find that customer acquisition costs are very high. 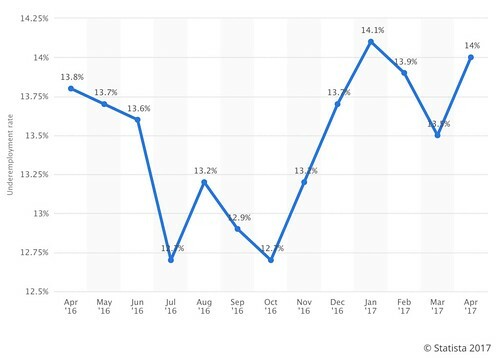 If I were marketing roses and wanted to advertise via PPC using the phrase “roses” I might pay as much as $10 per lead because this is a very competitive phrase. That could convert to $40 or $50 per initial sale. However our business uses low expense phrases such as “Ecuador”. 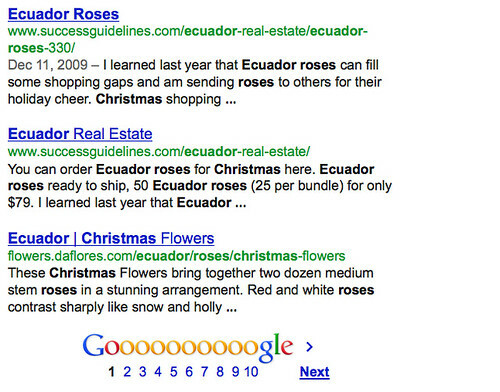 There are lost of flower sellers… not so many people offering information on Ecuador. That’s great, but I also found the connection that people who are interested in Ecuador are also interested in Ecuador roses. This creates an extra clientele FREE. This makes the extra CRO developed rose business highly profitable. Our first interest in CRO marketing began many years ago when I noticed that our international investing business attracted a disproportionate number of US southerners, Chiropractors and people of the Jewish faith. This puzzled me for years. “What is the connection?” I asked again and again. Then one day the answer hit me. “The connection was Persecution”. Many Southerners still feel persecuted by the War between the States. Growing up as an Oregonian, the Civil War was just an idea… known only through history books and the “Red Badge of Courage” which we had to read in our high school sophomore year. This was an idea without emotion attached. Then one day I conducted a seminar in Pascagoula, Mississippi and was talking about how the US economy grew after the end of the Civil War. One delegate jumped in with “Who the hell said it was civil and who the hell said it has ended?” After the seminar I asked the MD who had sponsored this seminar if that delegate was joking. The doctor said the man was serious and added that he believed the North had been beating up the South ever since. Chiropractors felt persecuted by the AMA. In 1987 a chiropractor, Chester A. Wilk, DC, and co-plaintiffs brought a federal antitrust suit against the American Medical Association (AMA) and other co-defendants. They won. The judge ruled that the AMA had engaged in an unlawful conspiracy in restraint of trade “to contain and eliminate the chiropractic profession”. The history of Jewish persecution has been repeated again and again. The connection between these three groups and international investing was that they did not trust the establishment. 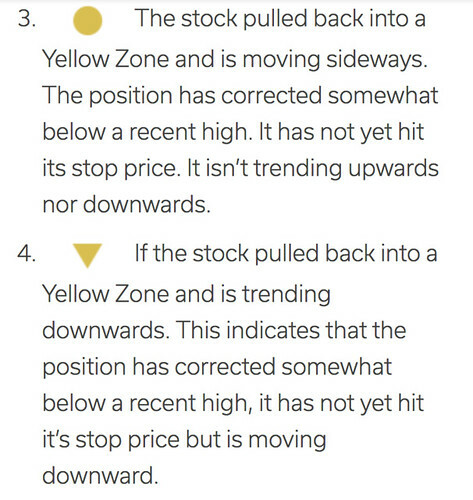 They were looking for alternate solutions in investing. The obvious cross reference from anti-establishment wealth was alternate health ideas. This has been the case. Our readers are interested in outside the box wealth and health ideas. The key to a successful export business is finding markets for the exports. Many successful marketers realize this and use Continual Cross Referencing (CRO). 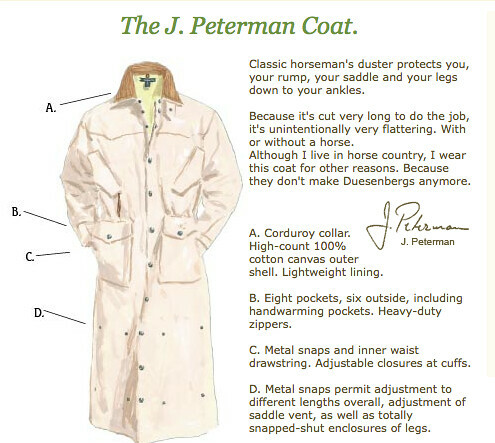 Let’s take J Peterman… one of America’s great direct marketing Pros as an example. 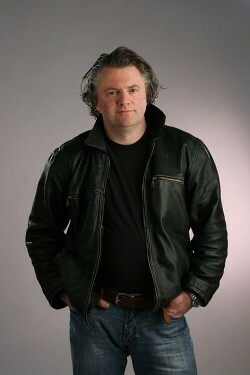 Peterman began marketing duster jackets in the New Yorker magazine many years ago. 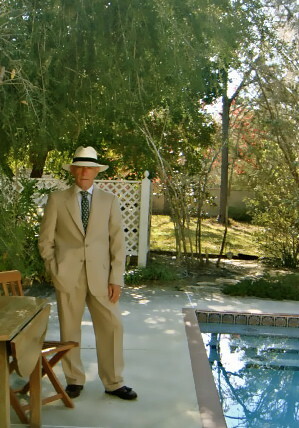 His business blossomed because he sold a lot of these coats and also found a connection he could cross reference. Peterman’s connection is that people want romance in the products they buy. 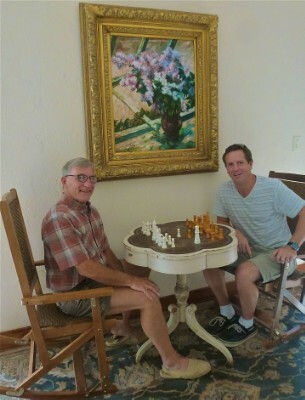 This connection has led him to sell hundreds of products ranging from David Niven blazers to Marie Antoinette nightshirts to Ecuador shaman shirts. The he even expanded into marketing romantic travel. Peterman’s business also exemplifies the goodness in exporting. His site says: The New York Times observed long ago that The J. Peterman Company’s mission was to bring people the world. The key to successful exporting is to find a product that attracts buyers who have a good CRO index… so you can offer them more than one product or service at a low customer acquisition cost. Finding the exports in Ecuador is now easier than ever before. 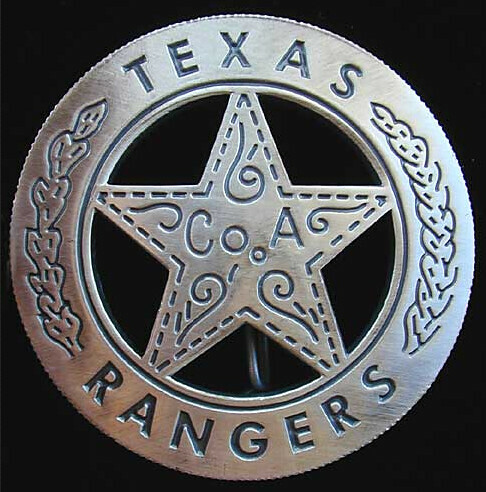 Here is an Ecuador export lesson from the Texas Rangers. This is when our flower supplier, Roberto Ribadineira, created a program to eliminate the red tape of exporting from Ecuador to the USA. #5: An annual PCI compliance review and certification. Roberto does this all with his Ecuador export logistics service. 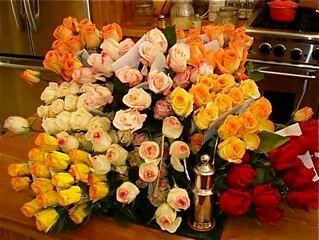 He sent me this note: Gary, A great new system has developed in Ecuador so that Flower Shops can now order direct from the rose plantations. We provide all these services for importers into the USA. We charge the buyer’s credit cards, do the FedEx labels, send the tracking number, deal with customs, pay duties when rehired, use our bond and broker coordinate and pay the rose plantation. 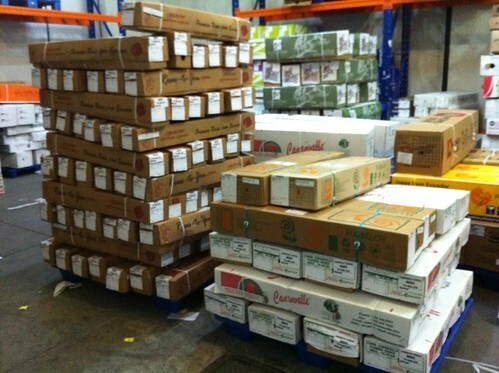 The plantations find that complying with all these requirements is too expensive so we do the entire logistic service. This is a great service that provides every detail for importing products into the USA. We have used this logistics service ourselves for years. 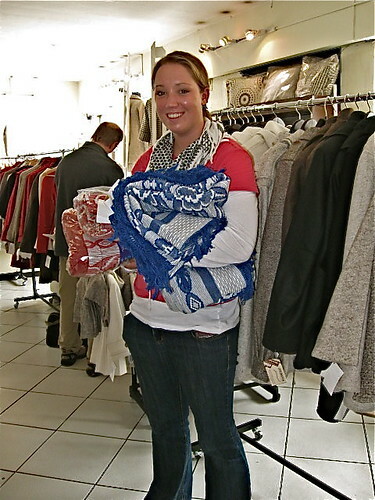 One big benefit is that the service can send each product direct to the buyer in the USA. 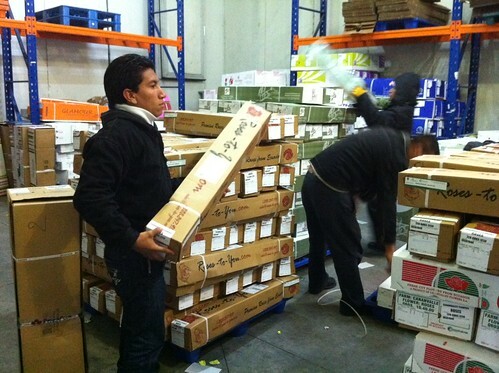 We offer the Ecuadorian roses… charge the customer and deliver the order to our logistics service. Everything else is handled by the service. The tracking notice and the roses are delivered direct to the buyer. The logistics service then charges our credit card and pays the supplier… so no money has to be wired to Ecuador. Roberto’s Ecuadorshop Logistics service makes large and medium scale Ecuador exporting possible. 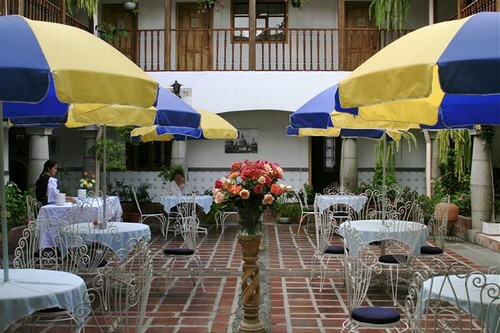 Our Ecuador Living Club make this service possible from smaller businesses. 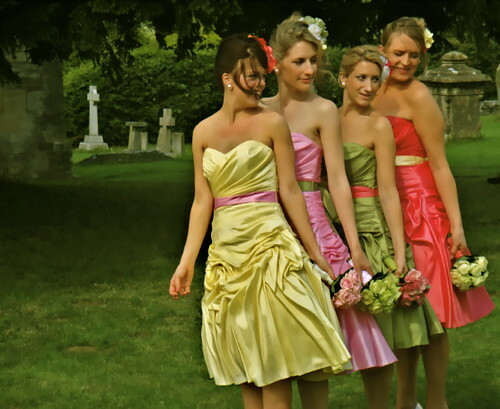 As you can imagine a service of this nature requires substantial set up and personal attention. Normally this would be available only to larger businesses such as rose plantations. Due to the size of our readership… the size limitation for acceptance has been removed. This is an exclusive service available to our Ecuador Living Club members. Once you have a product to sell… then you can use CRO to help that business grow. Join us throughout 2013 and learn… new ways to earn… low stress ways… that do the human community… big or small… good. One way to describe social media… you scratch my back, I’ll scratch yours. 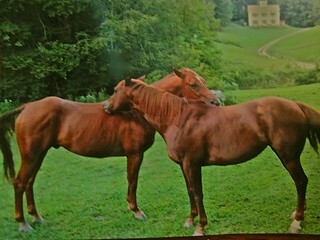 Two of our horses, Goliath and Harriet are always scratching one another’s back. Social media such as Twitter can be an important marketing tools for writers and event planners. Here is an except from the latest lesson in our online writer’s course “Self Fulfilled – How to be a Self Publisher“. Before explaining our latest testing of marketing for writers through social media let me clarify that the key to success in publishing is to have a way of communicating to a list of people who are interested, willing and able to pay for your publication or event. Social networking is simply one more way to develop such a list… nothing more. Social networking is a prospecting tool and nothing more. This is a great tool but no magical be all, end all. We invited Sandra to come to our previous Writer’s Camp to help the delegates learn how to use Twitter and social networking to market their publications. Thomas Fischer from Copenhagen also came along so he could learn how to spread the word about Jyske Bank’s great global asset management’s service for American investors. 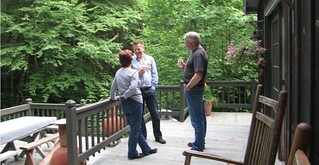 Thomas Fischer speaking with delegates of our latest Writer’s Camp during a coffee break. We have started to add tweets in our system now. #2: To gain more engagement. #3: To obtain better focus for our readers through interest extraction. Reach means that we’ll get tweets about our daily messages to our list and to my sister’s names. Engagement starts with having something of interest for those who receive the tweet. 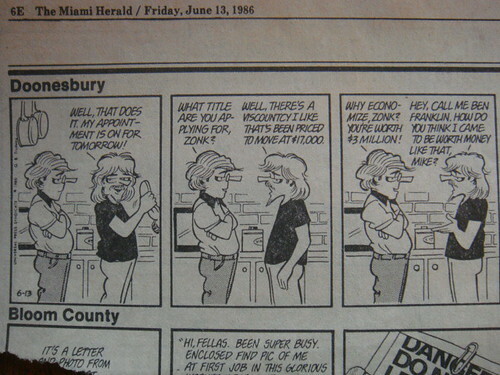 For example I just posted a three part Great Pension Robbery series. Note that each of these messages is about Jyske, investing and business but also had some element about arts and crafts. The arts and crafts element was tied to earning through arts and crafts. This is because Sandra’s Twitter list has been built around art and crafts. We are trying to extract those on the list who are interested in earning through arts and crafts. There needs to be something in the message linked to the tweet that is of interest and engaging. Then as we develop interest through engagement we’ll begin adding offers of free reports… such as “How to Cash in on Brazilian Bonds or “How to Have a Forex Account” to extract and identify those in the reach who are interested in engaging on the subjects that we have to offer. As this evolves, we’ll begin developing separate Tweet Lists so we can focus different ideas and keep a high level of engagement. For example, we might have a speculation list… a pension protection list… a leverage list… an earning through arts and crafts list etc. Engagement is about what followers do with your tweets and what you do with theirs. This can be reading it, following any links, replying, and retweeting it. Over time, part of the engagement will be loyalty… certain people looking for your tweets on a regular basis. Another component is your response–replying to a reply, RT’ing (retweeting) what they’ve said about your tweet, or interacting with your loyal followers by following and engaging with their tweets. The ultimate engagement hoped for is to buy a product, but I’m valued as a loyal follower even if I never buy anything (from those who tweet me) because my tweets and blog posts sell for them. A backbone of Twitter is to look for tweets you receive that are of interest to your list and retweet. When you scratch some other Tweeters back, they are more likely to retweet your tweets to their list. We have employed our daughter to read all the tweets that come to us and decide which should be retweeted and to which list. She will also be keeping a continual trending review… looking for hot subjects. For example recently we saw that there was a strong trend of growing tweets about Paula Deen (a popular chef in the US) having diabetes. When I spotted this I created a post at our website about one of our reports we have on nutrition and sent a tweet that said “Paula Deen needs to read a report about nutrition at our link”. Had we been working on a Tweet system for our multi currency focus we might have created a post at our site about Novo Nordisk the Danish Insulin maker and sent a tweet that said “See at link a share that might make a multi currency profit from Paula Deen’s diabetes”. The post then would have talked about Novo Nordisk… how diabetes is a growth industry… about Danish shares and of course have a link to our multi currency report. Those who subscribe to that multi currency report would then be added to our multi currency list. Our goal is to sell reports… to refine out lists and spot areas of interest that might lead to the creation of sale of other reports or give us lists that are effective at selling our other courses and reports and or events. Twitter is one result of modern technology that can greatly help new writers. When you have an itch to write, others can scratch it if you’ll scratch theirs! 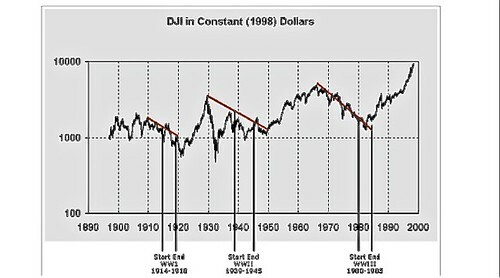 The recession and rapid economic change means that investors are getting screwed. 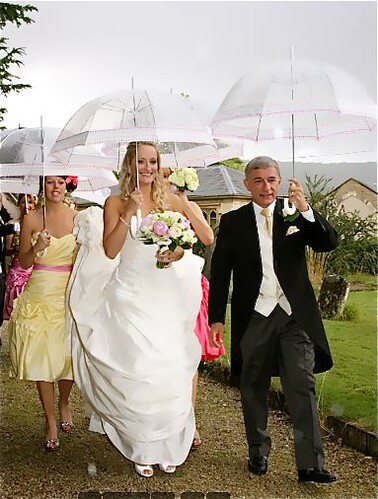 bride…daughter, Eleanor… were all dressed up and ready to go. began to rain. Everyone was dismayed. 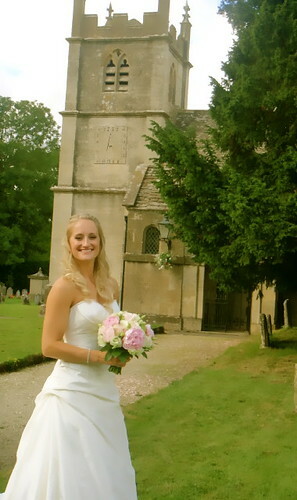 There was a long outside walk to the church. That changed their attitude and made them feel better about getting wet. 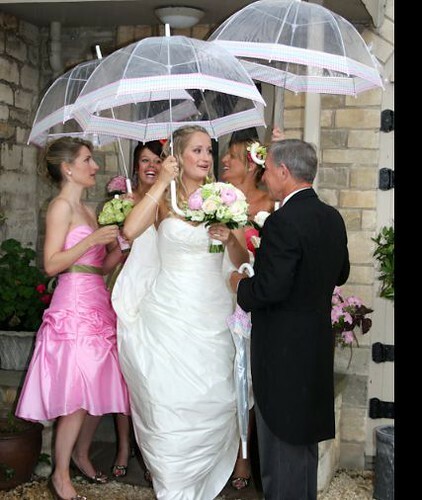 Then we hauled out the umbrellas so we were not get soaked. The lessons are simple. Have a positive attitude about conditions… because they are what they are. Accept reality and grasp the opportunities it presents. Change brings problems and problems create opportunities. So we go for it! But we also have umbrellas… just in case. It is with investments today. The global investing scene means that financing costs are really low. This is a great time to expand a business… that can take advantage of the change in the economy. Yet low costs mean that seemingly safe investments have such low returns that they are sure to be eaten by the inflation that will emerge. 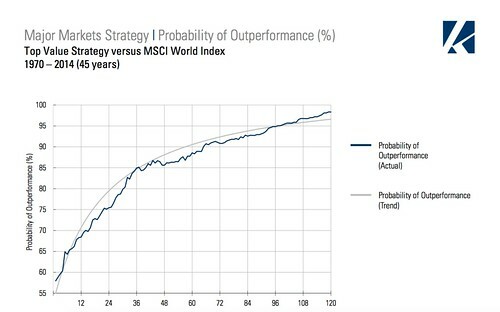 In today’s environment decent returns only come with increased risk, plus… if there is a double dip, even safe investment may become illiquid and lose value… at least in the short term. The greatest safety… our financial umbrella… comes from increasing our ability to serve. This is why our website increasingly supports ideas on how to develop micro businesses to earn income. They should be profitable, good for owners, employees, customers and society now and in the future… green… humanitarian… fair trade… at least. Here is a really funky idea… set up an upscale butcher in a foreign place. A reader sent this note to another reader in Afghanistan who is thinking of opening a sandwich and butcher shop there. 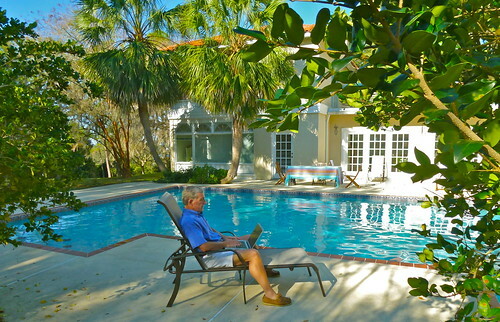 More and more boomers are exploring retirement outside the U.S. Many of them have been forced to do this because they can no longer afford to live here so the idea of affordable housing, built to western standards, is interesting. Of course, there will be local competition and real estate prices in Ecuador are already quite a bit lower than in the U.S. The key would be what you offered and the price range. Since you work in Afghanistan, you already know the challenges of working with a different labor force, materials, etc and how important it is to hire locals and involve them rather than compete with them. The sandwich shoppe is also a good idea. I have friends who want to do just that in Cotacachi. Instead of a butcher shop, they would do a small deli with sliced cheeses and cold cuts for sale. Otavalo has a similar shop. I didn’t see any in Cuenca or Manta, you would want to consider an area with a large expat community since Ecuadorians aren’t sandwich eaters—yet! There are butcher shops scattered around every town and market and I never encourage direct competition with the locals. We don’t want to be the “WalMart” of Ecuador and run the locals out of business. Maybe I’ll see you in Ecuador soon. 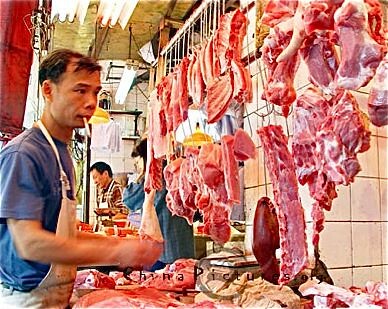 When I lived in Hong Kong, (the 1970s) an American serviceman had a high quality butcher shop there. The local Chinese were sophisticated master butchers when it came to pork, chicken and duck… but their style differed from what Americans were used to. Perhaps you can see in this picture why. This expat focused on American expat customers and offered Omaha corn fed beef… great hamburger and American style cuts. See how one Ecuadorian has the right idea to attract American customers in Ecuador here. If you live abroad amidst a growing expat market… such as in Ecuador… a micro business idea like this may work for you. 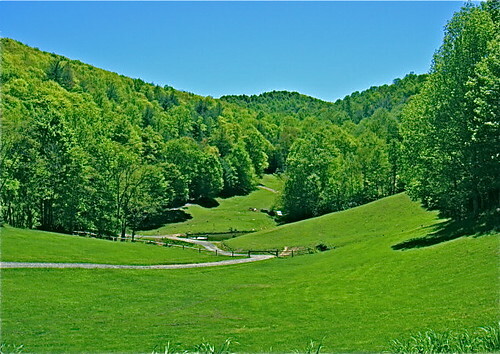 This is why we’ll have a special focus on how to create your own international micro business at our October 7-10 course in the Blue Ridge Mountains of North Carolina. Come join us for this course and the gold, yellow and orange of the leaf change See the schedule below. We look at investments as well as business opportunities like four shares I hold in my portfolio. One is an Italian bank… Unicredit. Learn how you can grab profits from shares like this at our 150th International Investing & Business seminar. Learn why the price, shown in this finance.yahoo.uk chart, of the Unicredit Bank share has more than doubled in just months, plus find out about a profit kicker that pushes those profits even higher than 100%. At our October seminar you can see all the shares I am invested in at the moment… and why as we look far beyond Italy into a world of global investing, business and more. The seminar is divided into three sessions. The first is International Investing… How to Have a Global Income and Quantum Wealth. Part One of the Seminar: International Investing. Protect your purchasing power byinvested wisely… globally. There are two benefits in multi currency investing now. For example the Unicredit Bank shares in my portfolio recently rose from 1 euro per share to 2 euro. This was a 100% increase. However in the same period the euro rose from 1.17 dollars per euro to 1.33 dollars per euro. The profit kicker is the euro. If one had invested $10,000 when Unicredit Bank shares were 2 euro per share… but the euro just 117 dollars a euro… and sold when the euro rose, a profit was kicked up even though the share price had not grown. $10,000 purchased 8,547 euro at 1.17. This would have purchased 4,273 shares. At 1.33 those same shares are worth $11,367… a 13.67% profit in just two months. Session One of the seminar looks at how to choose currencies when they are more likely to rise than fall. 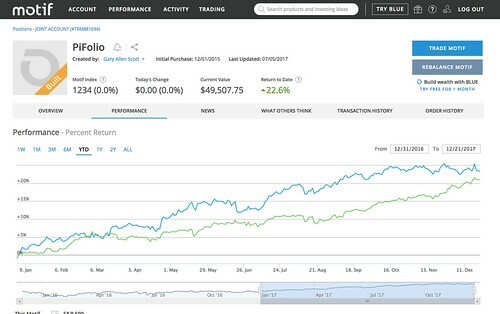 In the investing sessions we reveiw my updated portfolio and why I have made changes, plus my current seven favorite places to invest. Most teachers do not actually share their own personal portfolios… I do and explain why my portfolio is designed by me for my circumstances at any one time. Second and most important, I invest real time. The data shared in our courses is about global investments you can make in the here and now. What you learn is not dated theory, but up to the minute fact! 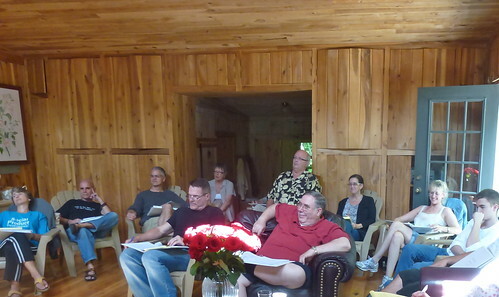 Many delegates come to course after course to update their portfolios. 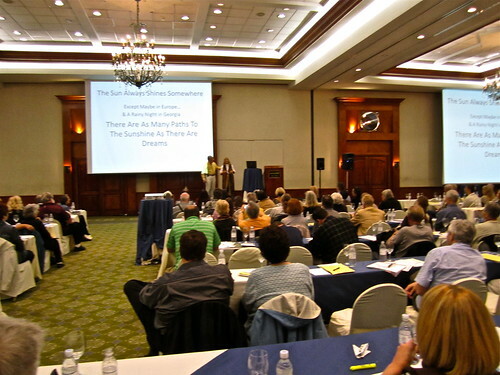 Part Two of the Seminar: Global Internet Business Sessions – How to Use Words to Earn Global Income.. This is why the “How to have a small international business” sessions in our seminar are highly practical and usable. They focus on how to use modern technology to start global micro businesses with minimal investments of time and capital… that can create valuable extra income. David Cross… our webmaster will help Merri and me unveil the secrets of gaining fun and freedom with a profitable, global micro, internet business. Part Three of the Seminar: Quantum Wealth. 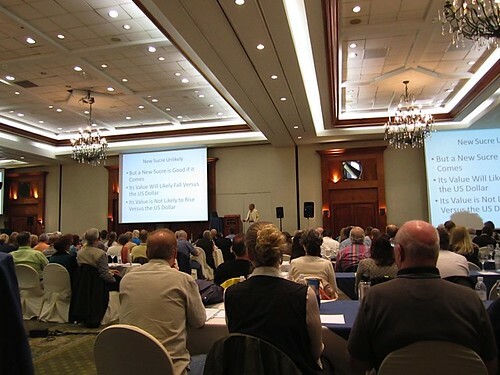 Modern science is once again rediscovering the fact that we cannot separate wealth from health so the quantum wealth portion of the seminar is about balance… the union between the body and mind… and how to remain balanced physically, emotionally and mentally in an ever increasingly unbalanced world. We call this Quantum Science. 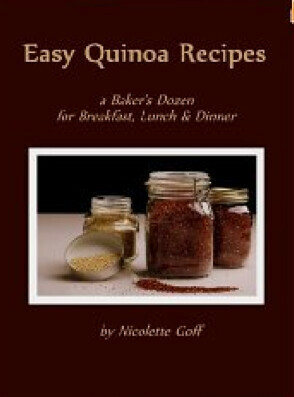 In the Quantum Wealth sessions you learn ideas about how to have Quantum Health… beginning first with nutrition. Bob will be available in October to demonstrate the most scientific and modern methods of physical balancing at the quantum level. He will bring three special instruments for balancing at the Quantum level…the Scenar, ESTeck and Core Inergetix. 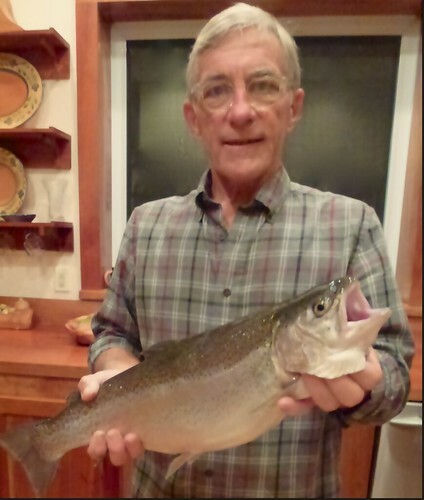 Learn more about Bob at Ecuador shamans use quantum science. 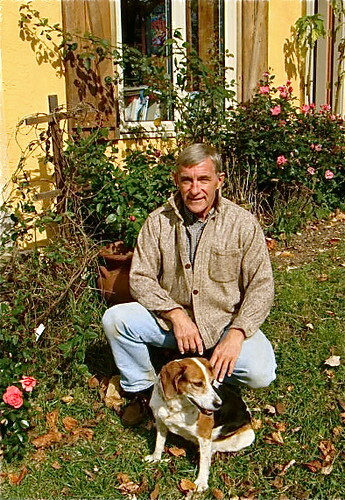 Jean Marie Butterlin will travel from Cotacachi, Ecuador to speak. 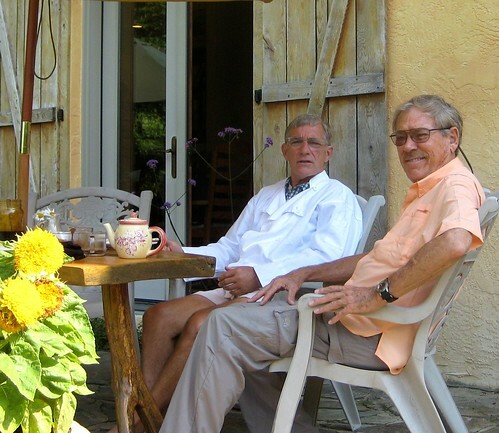 Jean Marie… a Parisian, after living in Houston and exporting French products to the USA, moved to Spain and built a business exporting natural health products and quantum balancing instruments throughout Europe. He has now moved to Cotacachi, Ecuador and has developed a natural health business there… plus he conducts our shamanic minga and Super Learning courses. Jean Marie will speak about Ecuador business and investing opportunities but also Ecuador health care and shamanic health. We asked our friend Ann Russell Roberts (Vitale) who has been professionally dancing and teaching yoga and dance for 33 years. Ann has been professionally teaching yoga, dance, etc. for 33 years to interesting people… such as Jon Bon Jovi. Ann is now a professor at Elon University. Receiving a scholarship to dance in New York City she moved and professionally danced, choreographed and taught there for 20 years. Ann will conduct the yoga-meditation portion of Quantum Wealth course to help you learn ways to integrate daily knowledge…. your logic with your own deeper peace and wisdom. We go far beyond yoga in our quantum wealth sessions shown in the total syllabus (subject to change with economic evolution) below. West Jefferson, NC October 7 to 10. 1pm: 1000 Year Economic Review‚ What Now? How to cash in on the multi currency evolution. Gary Scott. Knowing 1000 years of global economics can enhance your international investments and international business now. Learn how history reveals currency distortions that create international investment opportunities to borrow low and deposit high. For example right now you can borrow Japanese yen at below 3%, Swiss francs below 4% to invest in international investments, international business, international real estate or other international currencies that pay 5%, 6%, 7% and even more. In one case we’ll show why it is smart to borrow Swiss francs at 3.75% and invest in international Brazilian bonds that pay up to 10% or more! 3:30pm. How & Where to Bank Abroad. 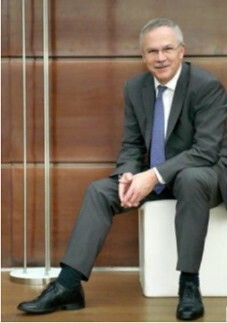 Thomas Fischer. Learn how to choose an overseas bank… what type of account to open… how to review of global stock markets, international currencies and international interest rates and how to spot shifts versus the US dollar. 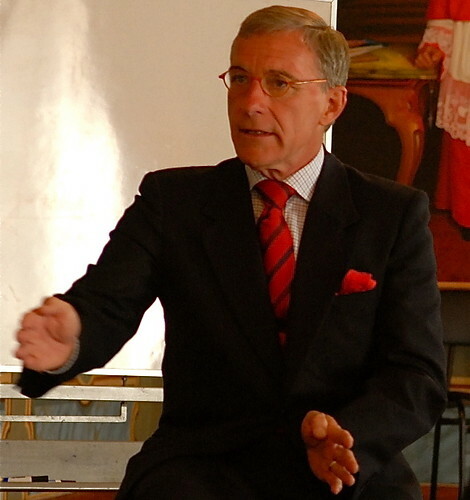 Thomas Fischer speaking with delegates at a previous seminar. 5pm: International investment portfolios for diversification. in several cases into nine currencies and nine different investments of which more than half have strong A to AAA ratings. We will review any changes made in the international investments portfolios we track and update what and how currencies and interest rates may move in the months ahead. In 2009 the emerging markets index (in US dollars) was up 58.99% compared to 23.05% for the same world index. Over three years the index on emerging markets was up 37.88% versus 17.27% for the world index. The emerging market index was up 35.63% compared to the world’s index rise of 18.43% over five years. You’ll learn why in 2009 we were investing in BRIC countries (Brazil, Russia, India and China).These 4 countries now generate approximately 27% of the world´s Gross Domestic Product (GDP). The average annual GDP growth of a BRIC nation was greater than 7% before the recession, as compared to approximately 2% for a G-7 nation. In the first three quarters of 2009, the growth rate for the Chinese economy beat expectations with an outstanding 8.9%. We look at a special BRIC trading idea in our 2010 seminars. The October seminar updates markets for 2010 and compares emerging and major market opportunity for 2011. 9am: Good investing sector #2: Emerging market bonds. You’ll see how I am earning up to 12% on safe emerging market bonds in Brazil and Turkey. Good investing sector #3: international investments in alternate energy and water. For example we’ll see why Hyflux (water cleaning membranes mainly in China ) rose from $1.50 to $5 in less than a year (and why it then fell dramatically). We’ll see why water shares are destined to grow. We’ll look at Vestas (windmills) shares also up from $50 to $106. Plus we’ll update our Green Portfolio. Good sector #4: How to Cash in on Smalltown USA. 10:30pm: Good investing sector #5: real estate in Ecuador. We have gained much more than just profit and international business and international investing opportunity in our international real estate searches. We have gained incredible luxury, heart- warming sweetness, breath-taking beauty, much better health and pleasant surprises at every turn. Having lived, worked and played in Ecuador now for over a decade, we’ll focus heavily there. 2pm: Global Investing Q&A plus How to use the latest tax savings and offshore legal structures to gain the ultimate asset protection. Learn how to gain more than cash-freedom, friendship, financial security, prestige, tax savings, legal protection, fun, adventure, self-sufficiency, fulfillment and more satisfaction…by combining very small amounts of money with your time and energy in an international business. 9am: How to monetize your micro business. Learn eleven ways to develop income. One section in this session shows how I turned a $950 direct mailing into $118,500 in three weeks. I added $9,875 a month to my income! This information is worth the cost of the course alone. 10:30am: How to write and use publishing, seminars and how to use international internet opportunities to create your own global business from your home. You can run your global business from an office or at home! The internet makes this more possible than ever before. 11:30m: How to have an International and Ecuador Import-Export Business anywhere. We’ll especially zero in on Ecuador export business opportunities in carved wood, ceramics from Cuenca, carpets from Guano, silver and gold jewelry from Chordeleg, paintings and art, textiles from Otavalo, leathers from Cotacatchi and flowers from the Andes . For example you’ll learn how factories make bread dough jewelry that can be fashioned into high school and college mascots and purchased for pennies apiece (to be sold for dollars abroad). You see how the only native American owned mill produces coats, shirts, sweaters, hats, gloves and scarves in school colors of your choice (at really low prices). These can be sold for ten times their cost. 2pm. Quantum Wealth. Multi-Dimensional Micro Business for Fulfillment & Wealth. The Sound of Wealth & Health. Quantum Mechanics & Frequency and how they affect markets and connect business and investing with health & wealth. 10:30am The Importance of Balance. Integrating brain waves and being in the zone… 60 cycle sound, meditation and beyond. The importance of being wise and how to have a global view. 2:00 Quantum Science in Health and Wealth. 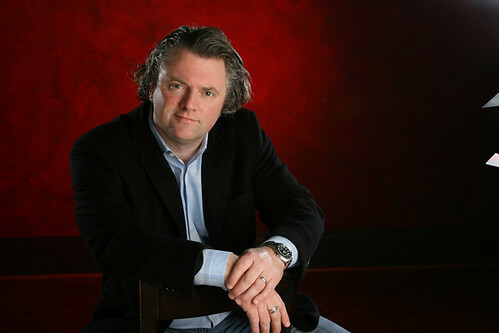 Bob Shane. 3:00 Balancing with the ancient, Tibetan Yoga Tsa Lung/Trul Khor as received from Tenzin Wangyal Rinpoche and Alejandro Raoul. 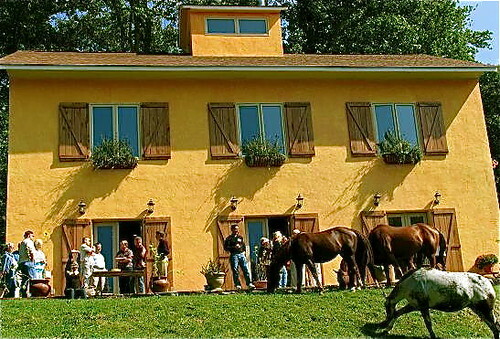 6:30pm Wine & Cheese Reception at the New River Winery hosted by Jyske Global Asset Management. 9am: The Andean – Indian Connection. Three fundamentals of longevity. How this helps improve business & investing. Three Foundations of Quantum Wealth. 10:00. Balancing with the ancient, Tibetan Yoga Tsa Lung/Trul Khor as received from Tenzin Wangyal Rinpoche and Alejandro Raoul. 1pm: End of course. 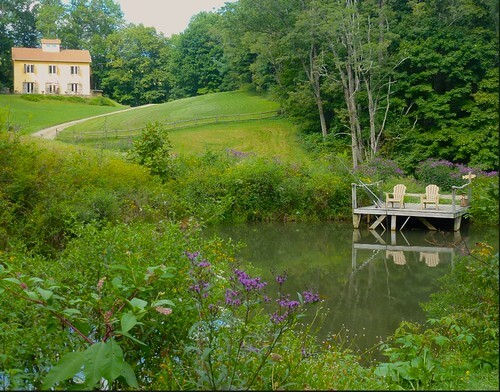 Delegates who have time are invited to our farm for afternoon tea. We invite you to join us in North Carolina for the leaf change and this weekend of learning and sharing.